NASBA’s process for tracking the status of federal agency referrals to state boards has been recognized in the Government Accountability Office’s “Single Audit Improvements” (GAO?09?307R) as a step toward addressing the recommendations in the PCIE’s (President’s Council on Integrity and Efficiency) June 2007 Report on National Single Audit Sampling Project (see sbr 7/07) . The recommendations were aimed at improving the quality of single audits, which are intended to promote sound financial management of federal grant funds administered by state and local governments and nonprofit organizations. The GAO’s report was released on April 10, 2009, and had been referenced by Marcia B. Buchanan, GAO Assistant Director – Financial Management and Assurance, at NASBA’s State Board Executive Directors Conference on March 13. NASBA’s tracking process was developed by the 2007?08 Government Agency Referral Task Force, chaired by Ellis Dunkum (VA). 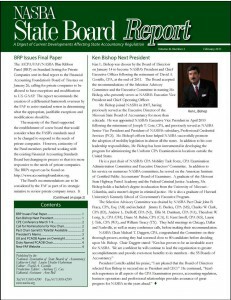 It is being implemented by NASBA Director of Governmental, International and Professional Relations Linda Biek and staff with the assistance of the State Boards’ executive directors.